Coolmax presents the new economical, cost-saving NAS Model CN-390 SATA Network Enclosure � supporting SATA I/II disks up to 2 TB! You can easily share files among Windows, Mac, and Linux clients via a local network or remote access via web or FTP. Its simple, web-based interface is easy to configure and requires no drivers or servers! Password protection delivers folder-level security. 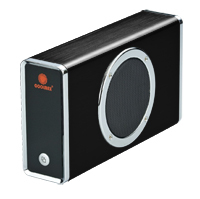 It is perfectly designed for a quiet environment with its aluminum housed noise-free design. Not a techy? Not to worry. This NAS is user-friendly - simple to understand, easy to use.